Atticus Claw is quite a remarkable cat. A former criminal mastermind, he is now the world's greatest cat detective. Atticus lives with the Cheddar family: the two kids, Callie and Michael; and their parents Mrs and Inspector Cheddar. Inspector Cheddar isn't the brightest, but Atticus does what he can to help him out. When Michael and Callie see a pickle-painting contest advertised, they decide to enter, together with Atticus. The winner will receive a trip to Butteredsconi's Italian Pickle Products Factory — which doesn't sound all that exciting, but at least painting their entries is a fun way to spend the day. 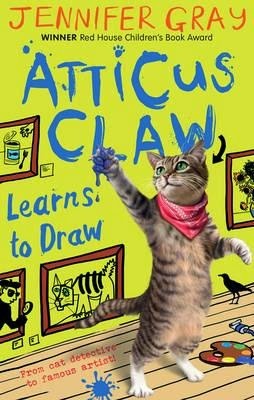 Naturally, being a remarkably talented cat, Atticus turns out to be a superb artist so only Inspector Cheddar is surprised when Atticus wins the competition. Off the whole family goes to visit Butteredsconi's factory. The owner himself, Ricardo Butteredsconi, takes them on a guided tour. He's quite a strange individual with a passion for art and a bizarre obsession for pickling that might even include animals! When Atticus recognises Butteredsconi's pig companion, Pork, as a former criminal, it's clear that all is not as it seems at the pickle factory. Could Butteredsconi have anything to do with the artworks that are being stolen from galleries around the world? There's only one detective who can find out — and that's not Inspector Cheddar! With a cast of criminals that includes a parrot, three magpies, a large ginger cat and an ex-KGB Russian mistress of disguise, this is a crazily inventive and very entertaining detective story. It's the fifth adventure for Atticus Claw. Confident young readers will enjoy both the fast-paced plot and the humorously playful writing style. But this would also be a good series for parents to tackle with children who are just venturing out as independent readers.